NASA reports that the New Horizons spacecraft has detected a tail of plasma streaming behind Pluto at a distance between 48,000 miles (77,000 km) and 68,000 miles (109,000 km). 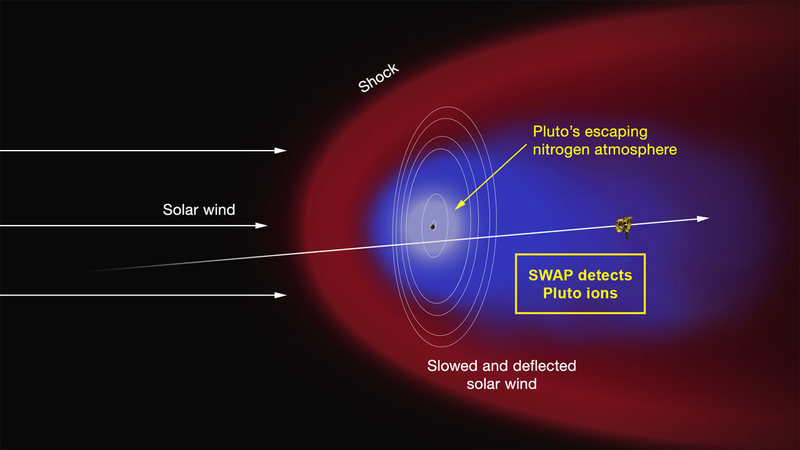 This plasma was detected by New Horizons’ Solar Wind Around Pluto (SWAP) instrument and is comprised of nitrogen ions that have escaped from Pluto’s thin atmosphere. It is theorized by NASA that “escaping molecules” are ionized by solar ultraviolet light, “picked up” by the solar wind, and carried past Pluto to form the plasma tail detected by New Horizons. It is interesting that ultraviolet radiation from the Sun is cited as the mechanism of ionization considering that the Sun is only an extremely bright star, less than a thousandth as bright as seen from Earth, when viewed from the distance of Pluto. Similar plasma tails have been observed at planets like Venus and Mars and Saturn’s moon Enceladus. They are ubiquitously linked to comets including 67P/Churyumov-Gerasimenko currently being observed by the Rosetta spacecraft. But plasma tails have also been observed trailing behind asteroids like P/2010 A2 and P/2013 P5.